Confirmed as the player at the top of the world rankings earlier in the day for the sixth consecutive month; China’s Fan Zhendong thoroughly justified the exalted stated by winning the Men’s Singles title at the 2018 Asian Games in Jakarta, Indonesia on Saturday 1st September. The runner up four years ago in Incheon, when beaten by colleague Xu Xin; four years later he made no mistake. On the concluding day of play, the top seed, after accounting for Korea Republic’s Lee Sangsu, the no.3 seed (11-3, 4-11, 11-4, 11-9, 11-5), he overcame colleague, Lin Gaoyuan, the no.2 seed (11-8, 11-5, 15-17, 4-11, 11-8, 11-6) to secure the title. Notably, it was the 11th time Fan Zhendong had met Lee Sangsu in a world ranking event, the perfect record was maintained. Meanwhile against Lin Gaoyuan he repeated the successes of earlier this year. He had beaten Lin Gaoyuan at the ITTF-Asian Cup in Yokohama and later at the Seamaster 2018 ITTF World Tour China Open in Lin Gaoyuan’s home town of Shenzhen. Success for Fan Zhendong means it is the 10th time China has lifted high the Men’s Singles trophy at an Asian Games; he is the ninth player from his country to achieve the feat. Only one player has won twice; colleague Liang Geliang succeeded in 1974 in Tehran and completed a successful defence four years later in Bangkok. Defeat for Lin Gaoyuan but on debut it was a most creditable performance and one that suggests he is very much in contention for inclusion in the Chinese national team at the world’s major events. Can he consider himself next in line to Fan Zhendong, Ma Long and Xu Xin when selection is decided? 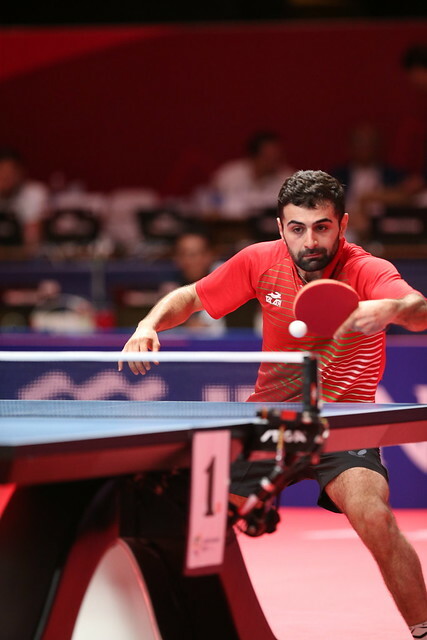 Notably earlier at the semi-final stage Lin Gaoyuan had been outstanding when facing Iran’s surprise semi-finalist, Noshad Alamiyan, the no.15 seed. He had recorded an emphatic straight games win (12-10, 11-7, 11-6, 11-2). Runners up spot for Lin Gaoyuan; however, it was mission completed, as it was for China, a full house, a clean sweep; a step ahead of the field.